De Jode: Nova totius Europae tabula. 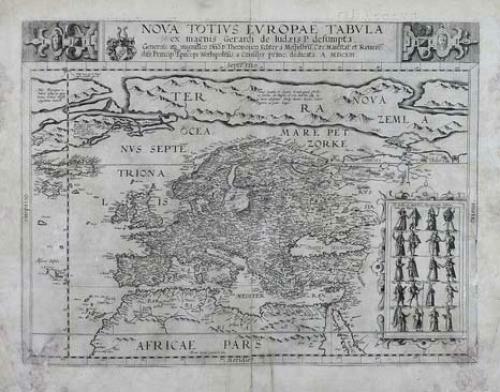 Title: 'Nova totius Europae tabula' from the atlas "Speculum Orbis Terrae". A very rare map of the continent of Europe, with in top a dedication to Theodor Echter von Mespelbrunn. With an oversized Nova Zemla, including the fictions islands of the Atlantic, including S. Brandain, Bresil and Frislandt. Several Northeast Passages. A large inset includes 20 costumed figures, representing the dress of various European inhabitants. A remarkable wide margined example. The map has some small repairs at the lower end. Overall good condition. Reference: van der Heijden, Europa, 37.